I have found my knitting books all over and some pretty random places, this month’s book was found at a friends of the library book sale in Lewisburg, PA. I pretty sure I got some out there pattern books that day, it was fill a bag for 10 dollars so I just filled first and looked later. 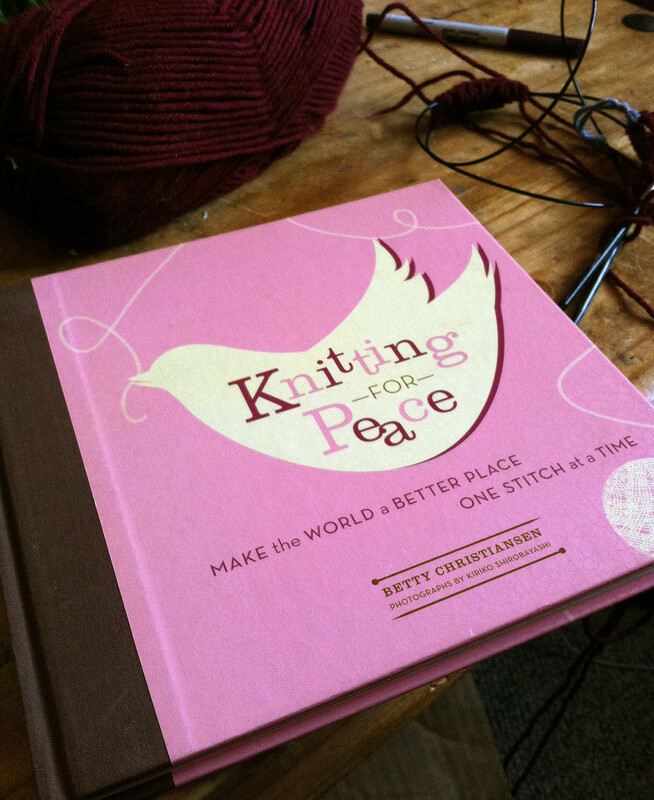 Knitting for Peace from Betty Christiansen is a collection of simple patterns that can be finished quickly alongside information about a number of charities, products, and information for knitters who what to make the world a little warmer. I’ve only read through a chapter and it is inspirational, it makes me feel like I should set up a world wide knit a long to make hats and mittens for everyone! Maybe someday but not today, plate is full and I already donate to local groups who give to local kids. If everyone gave to their community everyone would be warm. 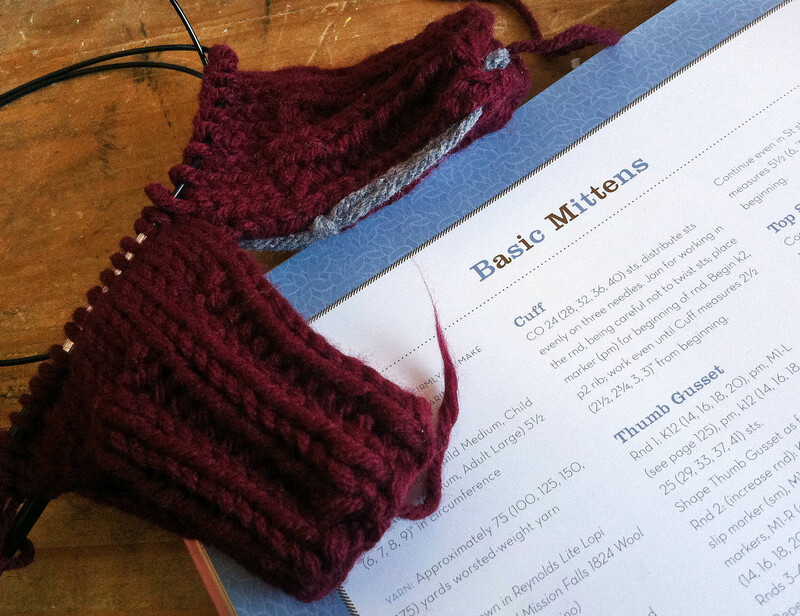 On to the pattern, Basic Mittens, and they are basic! I loved it, strait forward no frills, and quick. 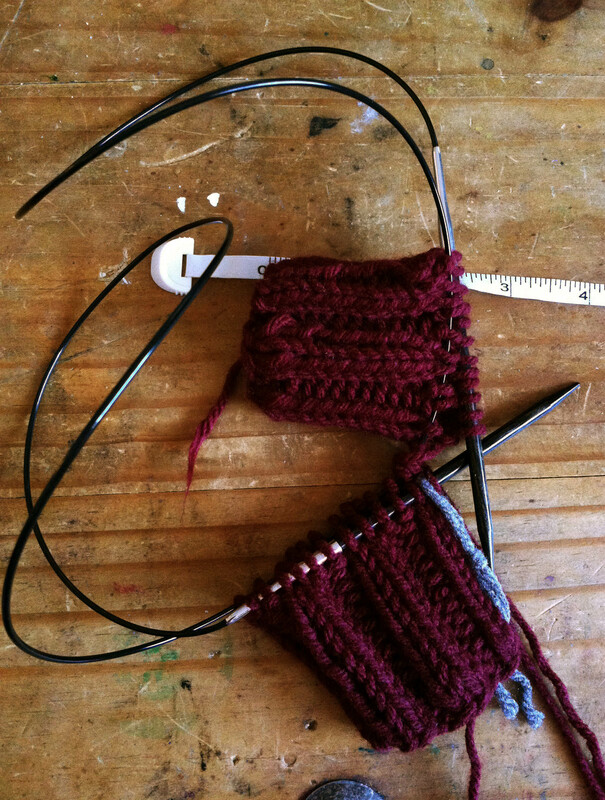 The pattern calls for using the double needles, which I don’t use, so I went with the two at a time magic loop method. 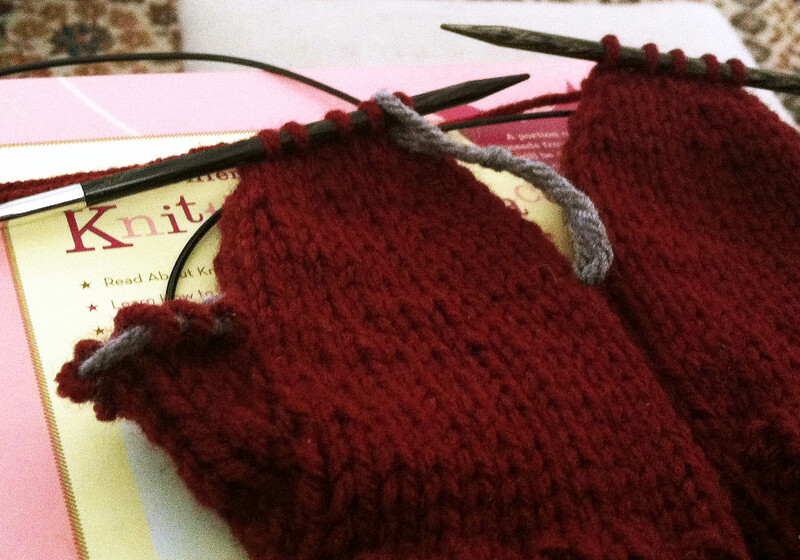 I always remember to put a place marker on the first mitten (or whatever you are knitting) so that they turn out the same length and I remember where I started when they get all twisted up. They always get twisted up early on but tend to stay in place once there are a few inches on. 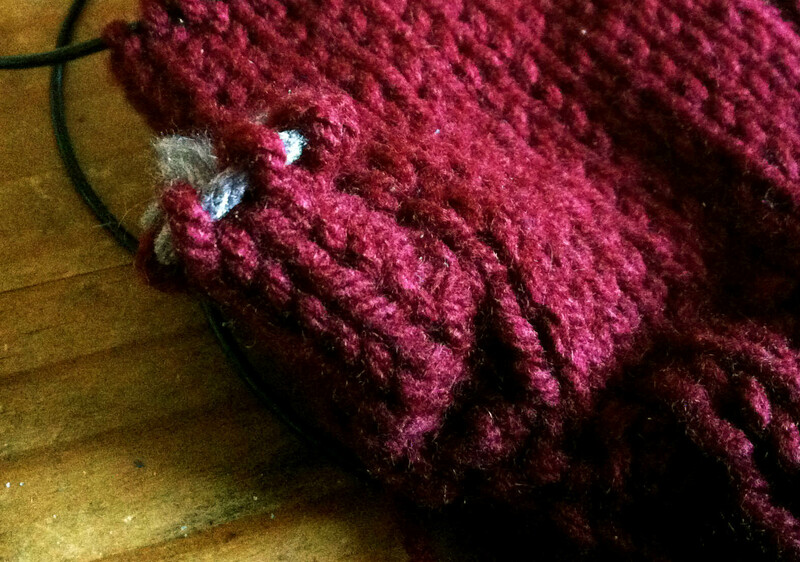 These have great cuffs, they are almost half the length of the who mitten, these aren’t falling off. I didn’t feel the need to change up, aka simplify, the pattern for my knitting style the pattern is nice to follow and doesn’t require the repeat glance. It does direct to knit to inch length rather than total rows, which is another reason that I like to knit two at a time. The method guarantees that the pair will have the same stitches per inch. I have found that no matter how close I measure and count if I knit separately they WILL be different sizes. 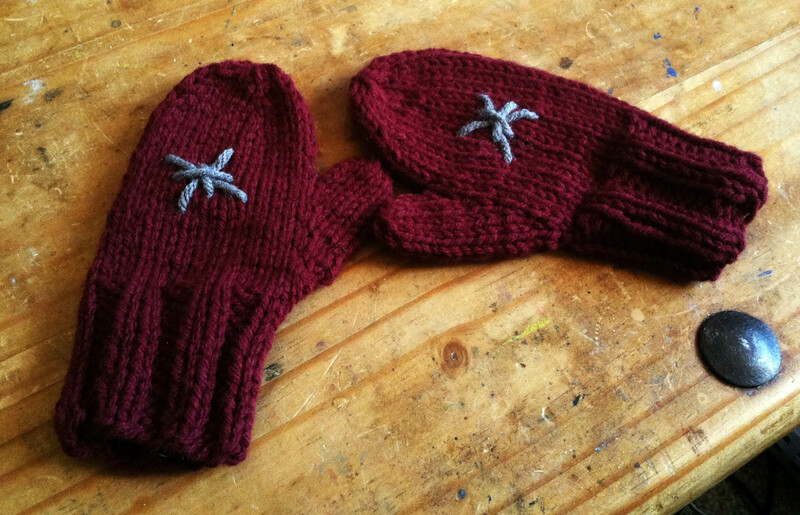 The thumb gussets were a breeze and since they mittens are the same on both sizes it doesn’t matter really which side you put them on. There is no top to accidentally but the thumb on the wrong side. Yes I have done that and I bet many of you all out there have done it too. I’m using up some of my stash yarn for this one since it is a kid size one it didn’t use up as much as Zach would have liked but he’ll survive. It is a acrylic blend so washable, durable and perfect for the wear and tear of a kid. 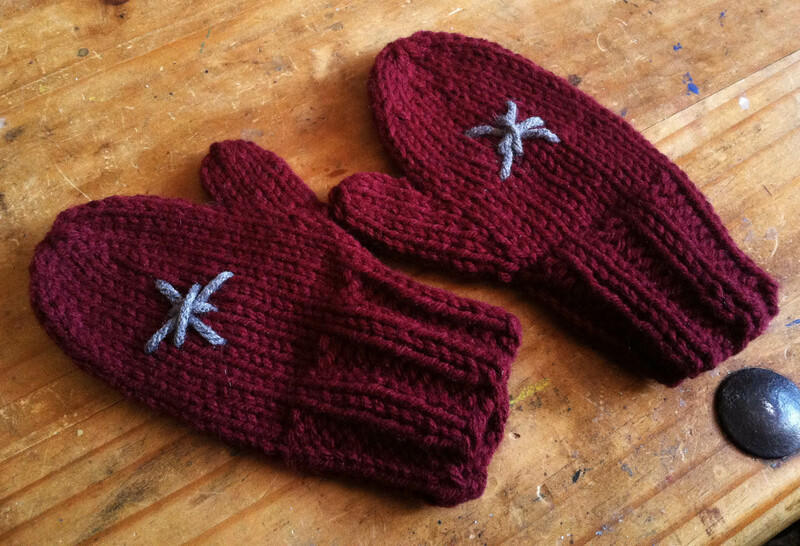 Alright these mittens are our February Giveaway!! If you would like a chance at them, leave a comment and share this post with those you know and love. The share button is right there at the bottom. The more the merrier. Good luck to you all! Oh right you might want to know how long you’ve got, this giveaway will end Sunday March 2, 2014 at 11:59 p.m. PST. I will make the announcement on Monday the 3rd. Just a reminder that if you share the post you get entered a second time. Congrats Rose you are the winner! If you can send me your address I can get them off to you. themadknittershop@yahoo.com. Auto correct is my nemesis. So cute! Darn that auto correct! By the way if you share the post you get a second entry.